The city of Salzburg – in particular the historic Old Town – represents one of the most beautiful areas to be found in Europe, a fact which received international recognition in the 1997 when the city received world heritage status. ... for a few hours from the hectic goings-on in the many squares and narrow streets. A climb up the hill is certainly worth it as you can enjoy the most beautiful panoramic view and “picture-postcard views” of the Old Town. the Baroque period as well as noble, classical bourgeois buildings from the time of the monarchy. There is hardly any epoch which has not left its architectural traces in Salzburg. The most famous squares in the city are the Residenzplatz with the fountain of the same name, the neighbouring Alte Markt, the Universitätsplatz as well as the Mozartplatz, of course. festival district with the large festival theatre where the annual carol singing takes place, and the Mozart house as well as the Felsen Riding School. the city lies Hellbrunn Palace with its trick fountains and zoo. themselves be enthralled. Whether artistic enjoyment, shopping, taking a stroll, visiting a café or simply just another day in the city – Salzburg's Old Town has many charming sides to it. 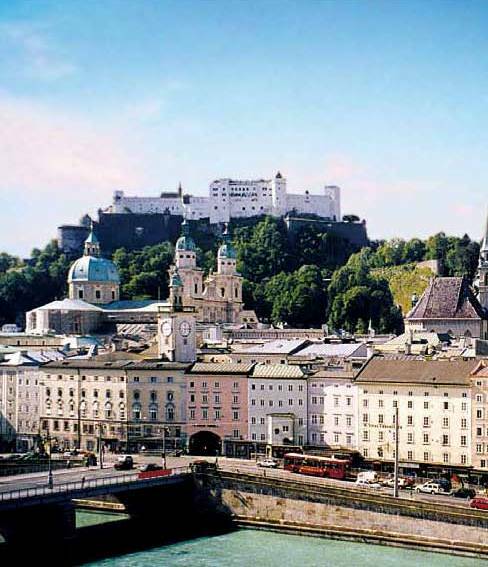 Detailed information on the highlights and attractions in Salzburg at www.Salzburg.info.